When Bernie Mertes was eight years old, he had the foresight to hide his 1962 Topps Mars Attacks cards from his mother. Violent and gory for their time, these shocking cards were disconcerting for parents. "Most people write to me and say, 'My mother threw my Mars Attacks cards away when she saw them,'" explained Mertes, who has created an online tribute www.marsattacksfan.com to the set. Marty Quinn, who owns several Mars Attacks registry sets, has heard similar stories. "The rumor is that back in the 1960s when kids came home with these cards, their moms said, 'Oh my God. Where did you buy these cards?'" he said. "Parents were really in a bit of an uproar." And understandably so. Cards depicting burning flesh, buxom women and dogs being zapped by aliens are bound to create an uproar, even today. 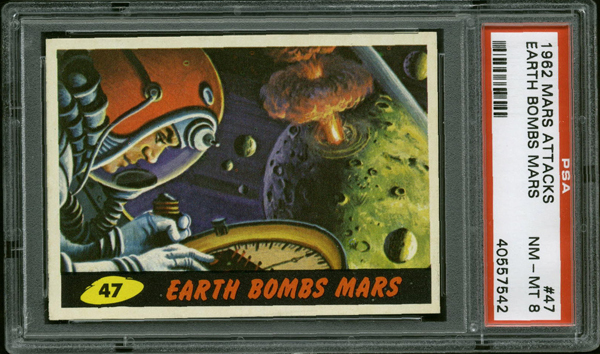 The brainchild of Len Brown and Woody Gelman, this 55-card set conveyed the story of ruthless Martians attacking Earth. At one point, Topps reportedly made efforts to tone down 13 of the most controversial cards, but after a complaint from a Connecticut district attorney, production was stopped completely. The commotion created by this set must have been somewhat surprising for Brown and Gelman, who previously collaborated on the equally gory 1962 Civil War News set. 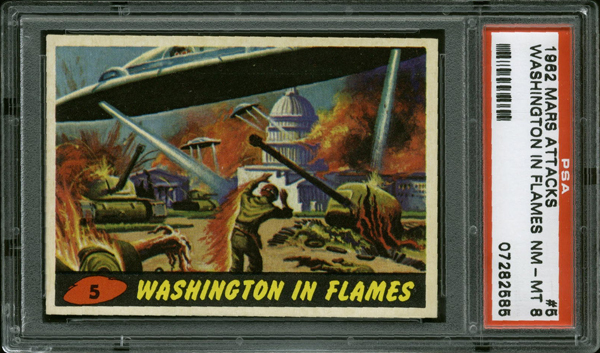 "Topps had produced the Civil War News set prior to the Mars Attacks and it was a very popular set. 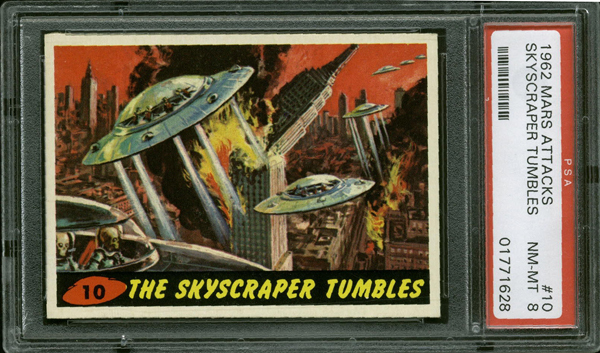 Topps had just as much gore in that set as they had in Mars Attacks. But because it was a historic thing, teachers and parents overlooked the gore and said, 'Oh this is historic. Kids are reading from these cards. The cards are kind of bloody, but kids are learning history,'" said Mertes, noting that some of the stories on the Civil War cards were fictitious. 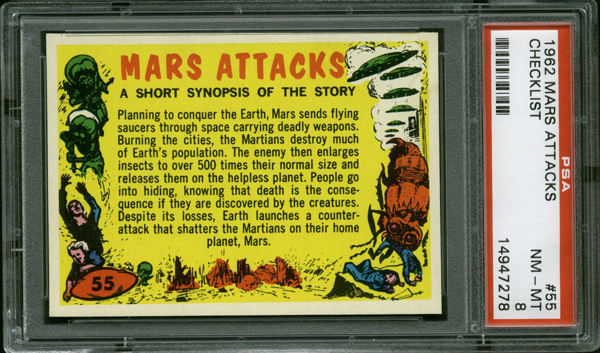 Brown wrote the story on the backs of the Mars Attacks cards. Wally Wood and Bob Powell were enlisted to work on the sketches and renowned artist Norman Saunders painted the cards. "There were a lot of people involved in the process of creating the artwork," explained Mertes. "It's not like today where most of the stuff involved is photos from movies. The hand-painted artwork is really kind of a rare thing nowadays. That's part of the appeal of these cards. They're so detailed and so colorful." Brian Karl, who owns the Registry's No. 7 Current Finest set, agrees. "As gruesome as it was for little kids, I just thought the artwork was fantastic," he said. These cards were distributed in five-cent wax packs that are now very difficult to find. "I've never seen an unopened pack," said Eric Roberts, owner of the Registry's No. 3 Current Finest set. Quinn, who owns a wrapper from this series, has had a similar experience. "I've never seen a wax pack... I imagine a pack would sell for upwards of $3,000 or $4,000," he said. High-grade cards from this set can also command big bucks. 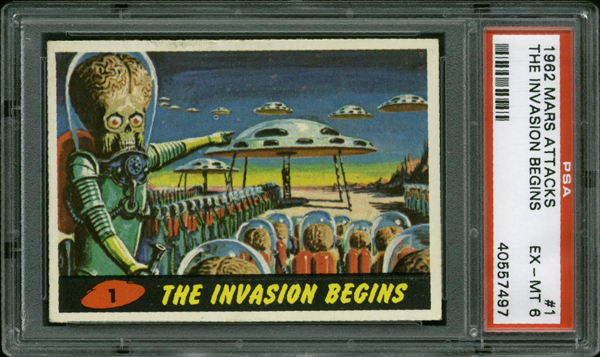 The first card – The Invasion Begins – is the toughest to find in PSA NM-MT 8 condition or higher. "The centering is usually 65/35 – maybe a little bit worse," said Quinn. And when the cards are in numerical order, the first card is on top of the pile, making it susceptible to wear. Of the 149 evaluated, there are 10 PSA NM-MT 8s (with no examples grading higher). A PSA NM-MT 8 sold for $3,600 in a Mastro Auction sale in May 2008. Like the first card, the set's last card – the checklist – is also vulnerable to wear. "Kids would usually mark the checklist when they found a card for their set. And the checklist was the last card in the set, which made it susceptible too, because kids would often wrap their cards in rubber bands. The rubber band would always dig in and ruin the first and last card," explained Quinn. Of the 164 checklists submitted, none have graded above PSA NM-MT 8. One of the 17 PSA NM-MT 8s fetched $2,872.88 in a Memory Lane auction in September 2008. Another single that commands a premium is card #21 – Prize Captive – a pasteboard featuring a Martian grasping a terrified woman. A PSA MINT 9 example sold for $3,500 on eBay in September 2008. 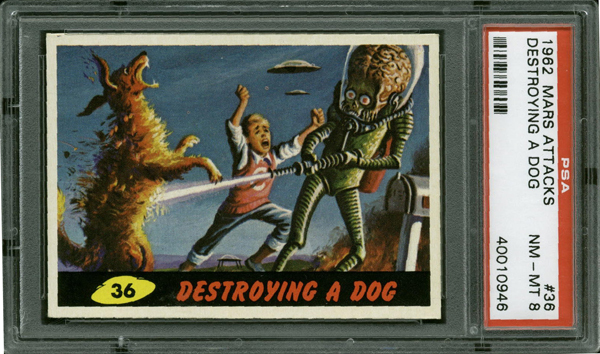 Destroying A Dog (#36), a card depicting a Martian zapping a dog, is also popular. A PSA NM-MT 8 example sold for $611 on eBay in February 2009. Roberts says card #43 – Blasting the Bug – was the last card he needed to complete his set. Featuring soldiers firing at a giant insect, this card boasts a chaotic military scene. "For some reason, that card seems to command a big premium on eBay," noted Roberts. The savvy hobbyist says this card also tends to be off-center. Of the 148 submitted, there have been two PSA MINT 9s and one PSA NM-MT+ 8.5. The PSA 8.5 sold for $2,259 on eBay in December 2008. Centering is the most common condition issue with these cards . "A lot of the cards I had were off-center a little bit," said Mertes. Karl has also noticed centering issues. "Centering was part of it. But I guess because of the pictures, a lot of people would handle the cards. You see a lot of worn edges and nicks on the cards," he said..
Nicks are understandable on cards from a 47-year-old issue that due to reprint sets, comic books, novels and a 1996 Tim Burton movie, has remained one of the most sought-after non-sports sets in the hobby. "If you want PSA 9s from this set, you can expect to pay at least $3,500 or more," said Karl. "I think this set is more popular now than it has ever been.". Please feel free to contact Kevin Glew at [email protected] if you have any additional information or comments. Brian Karl and Marty Quinn provided pictures for this article. Please note that the Population Report figures quoted and Set Registry rankings reported are those as of press time.